Hear the remarkable testimony of Florenc (Lenci) Mene, who grew up in Communist Albania, and converted to Islam as a teenager, dropped out of school to attend a Muslim madrassa full time, and eventually converted to Christianity, making the decision to follow Jesus. Lenci is now a Ph.D. student at the University of Edinburgh in textual criticism. His goal is to be able to answer Muslim objections to Christian faith—particularly that the text of the bible has been hopelessly corrupted over the centuries of copying the bible. Scott Rae: Welcome to the podcast, Think Biblically conversations on faith and culture. I'm your host, Scott Rae, dean of the Faculty and Professor of Christian Ethics at Talbot School of Theology, Biola University. We're here today with a very special guest. He's come all the way to Biola's campus from his home in Albania. His name is Florence Mene, he's a fascinating young man. He's currently a pHd student in New Testament at the University of Edinburgh in Scotland, but it's his faith journey that I'm most interested in you hearing about, Florence, he goes by Lencey for, for short, is a convert to Christianity from Islam and has a fascinating faith journey that we wanted you to hear about. So, let's see. Welcome. We're really glad to have you on the podcast and appreciate you taking the time to be with us. Florenc Mene: Thank you so much for having me. Scott Rae: Tell us a little, just a little bit about your background, sort of growing up in Albania, what kind of family you came from, what was that upbringing like? Florenc Mene: So, born and raised in Albania at a time where communism was the rule of the day, so, up to the age of 13 years old, I lived through the communist system, especially the last death throes in which time it was the most difficult time to be alive basically, in Albania because you are lacking so many things, including sometimes even even things like bread for example. And, at that time there was no way that you could hear the name of God being mentioned anywhere. Scott Rae: And, previously they had not been allowed into the country? Florenc Mene: No, there was no way they could have done that before. Even though some Christians did secretly come as tourists into Albaniana and they did talk to people very secretly and carefully. There was no way that you could actually do evangelism before 1991. And at that time what happened is I was walking by the street, go to go back home, and it's not even a street, it's a dirt path full of stones. And, I see this Bible lying down on the street. So I picked it up. I didn't even know it was a Bible. Florenc Mene: Yes. The first few pages and the last ones, it was a New Testament. They were ripped off. So, I took it home, I put it in a cover and my father who was an army officer, he told me, "whenever you see a book on the street, don't leave it there, take it home and read it." So I took it home and I read it and it turned out to be the New Testament. So. I came across this wonderful man, Jesus. I'd heard the name because of maybe we read it in books of history, but I had no idea who he was. So. I thought I believed in him. But what happened is I went to the Orthodox Church, the only church in town. My hometown is right in the south of Albania called Gjirokaster it is the birthplace of our communist dictator, Enver Hoxha. So, I had nowhere to go and ask for advice except for the Orthodox Church. I went to there for six months. I just didn't find the answers I was looking for about who this man Jesus was. And, then my change happened when a friend of mine invited me to the mosque where he was attending for about six months and he said, maybe your faith is wrong. So basically you might have to listen to my Imam, my mosque leader, so just come and talk to him." And I did. So we went there for about three to four hours, he gave me the whole Islamic version of Jesus Christ. What I liked about Islam is that Jesus Christ was respected according to them, that he was a prophet, considered a product. It was a good man, but that he was not who we think he was, that is, God becoming man. And so he said, "you don't need anyone to go before God. You only need to go to him straight away without any intermediaries, and so you can believe in Islam and do what is required for your salvation and you'll be a happy man because we have found the truth." I immediately after that conversation got converted to Islam, to the Sunni version of Islam to be more specific in Albania the population of Albania is 60 some percent Muslim, nominally Muslim. Most of them would be of the Sufi kind of religion. So, it used to be very tolerant towards other faiths and very few Sunni's before the Second World War. Now, after communism fell, we have lots of Sunni missionaries coming into Albania. Scott Rae: I think this would not be well known, I think to a lot of our listeners that Albania was such a majority Muslim country for a long, long time. Scott Rae: At the expense of everything else. Scott Rae: What did your family think about your conversion to Islam? Florenc Mene: My family, they were absolutely irritated at me to say the least. Scott Rae: So what was the religious background of your mother and father? Florenc Mene: They're Muslim, but in Albania, it's like in America today that they would say that they believe in a God, but they wouldn't say by faith Protestant necessarily. Florenc Mene: So, Albania was a post Muslim society because of 45 years of communism that no relationship whatsoever with God or Islam. And, so my parents also read, so they knew about the problems that Islam could cause in the world and they really disliked it and they liked Christianity. So, when I went to the Orthodox church for six months, they liked me and I might have had like a future there as well. But when I became a Muslim, they said I was just going to throw my life away. Scott Rae: So, for them, Christianity was considered a better option? Scott Rae: Even though they didn't understand much about Jesus or..
Florenc Mene: But that's why when you had the Bible, you gave it to somebody, they'll take it straightaway to that place and probably even read it because Christianity to Albanians after 1991 was connected to the west and everything that came from the West was good. Florenc Mene: Even though it isn't. So, you've converted to Islam. Your family's pretty unhappy with you about that conversion. Florenc Mene: At the time I was six. I did two hours a day. Seven, 14 I think at that point and 70. So at that point I said to them, "look, I am not only going to go to the mosque as a normal Muslim does. I really want to go further." I mean, my desire was, and it's always been, ever since I think I believed in a God, is to serve Him. I was going to find Him and I was going to serve Him. I wanted others to know about Him. So, I thought "I'm going to go to the mosque and then to the Islamic school called a Madrasa to become an Islamic leader. And, so I started teaching myself some Arabic through a friend of mine who knew the letters and also the sounds and so I started to memorize it and I went to the school and my parents obviously didn't like that either because basically what I was saying is I didn't want to have a career. I was going to be a religious person, you know, talking to people about God. But I absolutely love that. Scott Rae: Okay. So, then what happened? Florenc Mene: So what happened? Scott Rae: You obviously became somehow disillusioned with Islam for what? What happened that sort of caused the journey from Islam to Jesus? Florenc Mene: So, what happened is during those two years or two years and a half as a Muslim, I started to read a lot about Islam, about its history. And, I also started to talk to people who are nominally Christian about their faith. And, so I found myself wanting to read the Bible more and books against the Bible and more. Among them, one of the most famous Muslim apologists was who was also my hero, Ahmed Deedat. So, he wrote books against Christianity and he is one of the men who debated in by the way years back was Josh McDowell, and so I read all of those books and I started to have a great interest in apologetics as a Muslim and I thought "I have the truth" right? But, I didn't because the more I read against the Bible, the less convinced I became of what Islam has to offer regarding salvation. I know that most Muslims nowadays would say that their problem with this, with Christianity is the trinity or their problem with Christianity is the fact that the Bible has been corrupted according to them so we don't know Jesus's original message, but I think all these issues are important, but they're secondary. The major issue for me, and I suspect for many of the of your Muslim friends, for those who are listening right now, is how do I get saved, really? If God is holy, completely wholly unapproachable in fact, in Islam, and I'm not holy. I was not born a sinner according to Islam, but all of us become sinners at some point. So, how do I get saved when one day I go before God and Islam does not have a clear answer at one point it says, "all you have to do is believe." But, then it also says you have to do so many other things so you can keep your status. And, then one day you still don't know where you're going. That kind of confuses you. And then one day I read one of Mohammed's hadids or sayings that one day Muhammad was saying to his friends, you know, "every man's grave is either a garden of Paradise or the fire of hell." And," then he cried, he wept, and he said, I wish I knew where I was going." Florenc Mene: Now, if that's modesty, I think the Prophet of Islam chose the wrong religion to be prophet of, because when it comes to matters of salvation, I really want to be sure I was scared of God. I was probably, in fact, I was exactly like Luther. I was scared to death of one day facing the maker of the universe and I needed to make sure that I was going to be saved. Scott Rae: And, you asked those questions, you know, honestly and openly. Scott Rae: Straightforwardly to your Imam, to Muslim apologists. Scott Rae: And this is the best answer you got. Florenc Mene: So yeah, so sometimes there was no answer at all, but I kept reading. I was an avid reader because like I said, I was interested in apologetics so I was an avid reader. And, then the more I discussed my opinions with those who are not Muslim, the less convinced I was that I was actually giving them a sincere answer because my heart was fraught with questions and doubts. And, so what happened is, after at the end of that academic year that was my first year as a Muslim student, not as a Muslim, but as a student I was invited by a person who doing a so-called crusade, but in the positive sense of the word he would, it was an evangelistic campaign on the part of a church. There was this man there who didn't speak Albanian well and who was Brazilian. So, he was fluent in Portuguese obviously, but he didn't know Albanian well and he didn't speak English at all. And, so that forced me to actually listen to his answers rather than debate him. So, he was very humble enough to say, "if you'd like to meet with me, we can meet together, we can discuss our faith and then you can make up your mind." And so we did that for about a month. When I first met with him, I said, "I'm not gonna debate with you, but all I want you to do is respond to.." I had at least 100 questions that I'd come up with during my Muslim faith and I said "I really want you to answer all of these questions from the scriptures and if you don't know the answer, it's fine if you say I don't know the answer because you're a human being, but don't give me Christian airs because I'll understand. I know the Bible already. I just want to hear it from you as a pastor, somebody who walks in this kind of faith" and he did that. So, there is something to be said about maybe not being a great apologies, but something to be said about knowing the scriptures really well. That's more important than any arguments sometimes. Scott Rae: Would you say that's characteristic of many Muslims? They actually. They actually know the Bible fairly well and can reason with Christian apologists sort of on their own terms? Florenc Mene: Yes, because normally nowadays most people, at least in Albania who are following Sunni Islam would be first generation Muslims and especially young men. They've taken over the the old you know, kind of formalistic faith of their forefathers and they've said, "no, we want to believe personally in this faith" and the there'd be many of them know the Bible, I think unfortunately better than many Christians do. Scott Rae: So, this person you began meeting with..
Florenc Mene: And his name was Emmanuel, which was an amazing coincidence. Scott Rae: Nice coincidence and Emmanuel was able to answer, was most if not all of your questions? Florenc Mene: Not all of them, but certainly most of them. And, what is more important is that he didn't just feed me intellectually, but what he showed me is that he really believed in what he was giving me as answers. That is something that you cannot fake. And, so at the end of that month, I basically made a deal with God before I met with him and I said, "God, I still believe in Islam. I know that for me, this is the truth. And I feel like I'm being a renegade, a traitor." But I said, "just to be fair to you throughout this month, I'm not going to pray as a Muslim. I'm only going to pay to you as an Albanian, but not the five times a day prayers. And I'm not going to read the Koran or the Bible. I want you to lead me to the truth." I said. I know that far smarter people than me, Scott had made different decisions after reading both books. So I said, "who am I?" I'm I was only like 14, 15 at the time. As I said, "who am I to be able to, to judge?" Well, yeah, this was 1995, so I was 17. And, at the end of that month I was convicted and convinced even though I didn't have all the answers, by the way, I still don't, and my area is apologetics. That's what I'm doing. That's why I'm doing what I'm doing for my pHd. But, I was convicted by this Jesus Christ and I knew that the answer to my question was simple. To be saved you cannot, you cannot save yourself. So, how does God save me? He has to become me. He cannot send an angel because the angel are ,creatures like we are, we cannot send them man because they're sinners like we all are. So somebody who is God must become a human being to intervene and give me salvation. The answer is that simple. It's not that I never knew it, but suddenly I realized it is the truth. And, so I embraced it and I was fearful now. Florenc Mene: Because, I came to Christ, but then I needed to go back to my friends to tell them about my faith. Scott Rae: So, what happened with your Muslim friends and the mosque you were attending when you came back and told them that you had rejected Islam and embraced Jesus. Florenc Mene: So, when I came to Christ I was in a different town from my hometown. So for at least two months I stayed there because that's where my grandparents lived. And, that was my honeymoon with the church. It was very brief because I just loved going to church. But then my question was, school was coming soon in Albania. It was in September. And so what do I do now? Do I go back to my Islamic secondary? We call the secondary school is like high school. Do I go back there to my Islamic friends? Scott Rae: Because, you had dropped out of that to go to the Madrasa? Florenc Mene: Exactly. So, I was in the Madrasa. Scott Rae: The Islamic school. Florenc Mene: The Islamic school. It was summertime, but then I got converted, I came to Christ. So what do I do now? My desire, obviously was not to go back to the Madrasa. I just couldn't face them because I was the best student there. I was the one who told them, in fact, I once I remember reprimanding a whole group of students why they didn't come to the mosque to pray. And, so now I had to go back. I didn't just feel like a traitor, but like a foolish person, you know, for such a long time to have misled my own friends and I didn't want to face them to be honest. I was scared to death and I said I'm going to the normal public secular high school. And, then got as never before and probably as never after until now, he gave me this particular verse from the Book of Acts where Paul is talking to the efficient elders and it said, "for three years I talked to you and you are my witnesses that my blood, my hands are clean from your blood because I gave you the whole counsel of God." And I said, "but what does that have to do with me?" you know. For at least a month that's kept hammering my brain, that verse and never left me. So,, I knew if I didn't stay on, I would have my friends blood on my hands because maybe that will be the last time they'll ever hear about Christ. And in fact, I found out later on that one of the guys who was my fellow student went to Egypt and died there in a car crash. So, I stayed on. Scott Rae: So how did they respond when you told them about your conversion? Florenc Mene: That was the year where every single morning I walked. It's a beautiful town, my hometown. I walked through some trees going down to school for about half an hour every single day my stomach was in knots, every single day because it was a fine. It was a place I didn't want to be and I needed to tell my friends about the faith, so all of them heard about it. I debated with some of them. None of them came to Christ unfortunately. But, I did give them, as Paul says, the Gospel, which is an aroma of death or an aroma of life to some others, and at the end of the year I was kicked out of school because they found out I'd become a Muslim and they kicked me out. Scott Rae: Even though you had renounced Islam by that time and come to faith in Christ? Florenc Mene: Yes, but that's all they kept me on for a year because it was a turmoil at the point of my school. The staff was changing, so it is exactly what God does to protect you sometimes. It was very sovereign, but by the end of the year they already knew about me, so they said if, if I am the headmaster wanted me to stay on and so he cajoled me into..he wanted me to accept an offer of after studying there to get a very good scholarship, which in Albania, by the way we have no money to this day, but a scholarship to go to one of the Islamic countries and study in whatever I wanted like politics and what have you, but I couldn't do that because if I stayed on that meant I would have to go to the mosque. Florenc Mene: And so I was, like I said, I was kicked out, but I felt also that I had completed my mission work there. Scott Rae: So, what did your family think when you denounced Islam and came to faith in Christ? Florenc Mene: So in my parents words, who was a stern and still is a stern former army officer, he said "first it was Christianity Orthodoxy and then it was Islam. Now it's Protestantism. What's next? Buddhism?" So, that meant I really lost his respect. Scott Rae: That's kind of a cynical response. Florenc Mene: It is, but you know, it makes sense if you're not a Christian, it does make a lot of sense if you don't believe that this is the most important thing in the world, of course you want your son to have a great education rather than just waste his life away, you know, by doing something that doesn't benefit him financially at all. Scott Rae: Now, you bet you've been a Christian for what, 20 years now? Scott Rae: So, that would be 20, 20, 23 years. What does your family think of you now? Florenc Mene: So, my family respects me now because I'm married and so I was married to this wonderful girl who is a pastor's daughter. They saw and found out that, you know, Christians are normal people too and good people too. So, they respect us more. They still don't understand what I'm doing. And, to be frank with you, there comes a point in your life as a missionary or as a theologian where you sometimes you want to yourself because the challenges are so, so, so many. It's not easy as you will know, to to devote your life to something which sometimes nobody understands, but we're happy to be in this point of our lives and if I were given the chance 100 times over to choose a different career, I would still choose exactly what I'm doing right now. Scott Rae: So, our listeners need to have some context for this. You're a doctoral student in New Testament at the University of Edinburgh and president and you are specializing in an area known as textual criticism, which is the science that actually tries to establish as close as we can do with the original New Testament texts was. Tell our listeners a bit about why you chose this area and how it's important for your apologetics and for your proclamation of Jesus because it sounds like it was really technical field that doesn't have much to do with real life. Scott Rae: I thin that's what some of our listeners might think, but I know in talking to you that's not true. Explain that to them. Florenc Mene: That goes back to 24 to 25 years ago when I was a Muslim. I wanted to convince Christians that the Bible that we have today has been corrupted to the point where we cannot establish the text. Therefore, whatever the Bible says about Christ divinity, claims and other claims like in terms of Christology, in terms of salvation is only a wrong because it's not what Jesus really taught. And, so when I came to Christ, I immediately knew, immediately knew my calling. I wanted to convince others that I had been wrong all along and that the Bible we do have has been transmitted so well that we know it's original message so well that you can only deny or accept the claims of the one who actually made them Christ and the Apostles. ,And, from that point I had no idea how to start. I wanted to learn Greek. I wanted to find out about it, about early church history. And, so I took hold of many books as I could and I taught myself. And, then when the opportunity arose to do an MDF and then to do an MTH and to do an NEL at Cambridge last year and now the Phd, I took it. I took it because I wanted to fulfill the vision God'd given me. And, I have been focusing since then on the area of early Christianity and textual criticism. Somebody called it chimney sweeping at some point. Text criticism is just not very technical. You only deal with the text. But, the thing is for Christianity, it's ultimately the most fundamental issue when you talk to Muslims. You cannot talk about the old if you cannot establish that the text of the Bible you do have is the one that has been transmitted faithfully for 2000 years. And, that's why I'm doing what I'm doing and I'm at this point, I'm also involved in a project. I'm translating the church fathers into Albanian from the original Greek and writing a commentary about it. For the first five centuries, I want people in Albania to know that the Bible was so well respected by the earliest Christians that it changed their lives and despite their flaws, which are many, like ours today, we need to listen to their voice and when we do that, we understand that the Christianity of the first five centuries is the Christianity to which we have to be thankful for, for what we are today because they basically delivered to us what they had heard from the earliest Apostles. Scott Rae: And, the texts that we have today. Scott Rae: You've concluded so far. Scott Rae: Is utterly reliable and there's no reason to discount. Scott Rae: The New Testament because of the allegation that the text has become corrupted as it was passed down. Scott Rae: It sounds like what you've concluded, there's just not any evidence for that. Florenc Mene: Yes. And, if a personal testimony will suffice, is, I wouldn't be doing what I'm doing today if I didn't really believe that because a, I'm not being paid for this. B, I don't really have even a job or something. I'm doing this because I firmly believe that my studies have confirmed that pure simple faith that I first started to have 23 years ago when I believed in Christ for the first time. Scott Rae: Well, I think, let me encourage our listeners to be in prayer for Florence, because he's embarked on a calling that you know, you may think for yourself, "wow, I'm definitely not called to do that. I'm not wired to do that." I mean, I know for myself, I know I'm not wired to be a text critic a because, you know, that's, it's incredibly detailed and complicated stuff and sort of task you've undertaken is a pretty complicated one. But, I think you can see out of his former experience with Islam how important that question is. That's so telling to say that that's the first thing that Muslims ask about Christianity is how do you know that the text that you had that we can actually trust it. Scott Rae: And, so I commend you significantly for the path you're on, for, how you've gone about. Let me ask you one other question, right? So, I'm, I'm hoping our listeners be sure and pray for him as he continues to study. Tell me we have a lot, a lot of efforts going on in the United States and a lot of the West which are toward Christian Muslim friendship, a Christian Muslim dialogue. Scott Rae: Tell me, what do you think of those types of enterprise? Scott Rae: Christian colleges have them too. But, it's part of their faculty of theology idea. It's part of trying to have it's money, it's money matters because they want to have as many students from different face on because they paid the fees, but more importantly because they just don't see the difference and they just don't see why it is important that we should be, you know, more different than, than the same. So, what I'll say about dialogue is this, first of all, dialogue is great and it's necessary because if you don't really know what Muslims really believe and you only keep reading Christian books about what Muslims believe, you'll never really find out about what they, how they really think about things, how they really believe. It's not just what but how they really come to that realization so it's important, but you cannot have dialogue without first having two things in place. First, you as a Christian, you should know well what you believe because they are going to tie you in knots if you don't know what you believe. They're going to mess your mind because they know sometimes Christian did better than we do. That's, I think that's a really helpful perspective on this because there's a lot of dialogue going on, but I think some sometimes you know, say those are good words of encouragement and ,words of caution. So thank you so much for coming on with us for sharing your testimony. 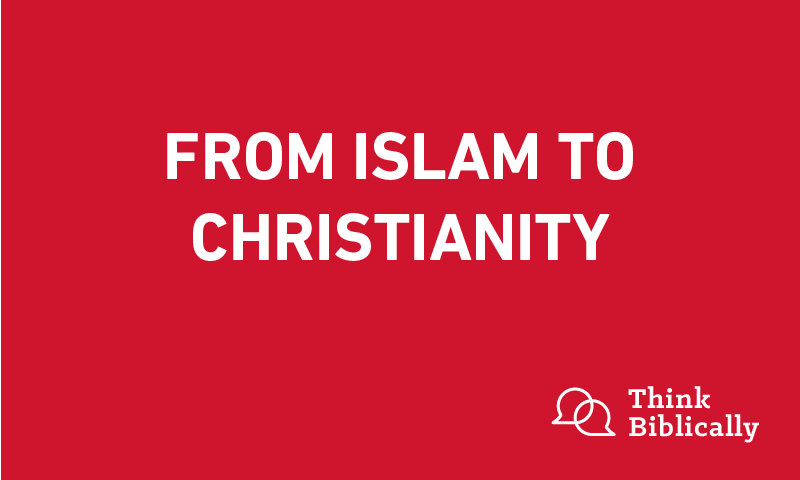 This has been fascinating to hear how you've come out of Islam, embraced the Lord Jesus. And, now we're embarked on graduate study that's enabling you to go back and answer the question, the primary question that most Muslims ask about Christianity. So, thank you so much for joining us on this. Florenc Mene: Thank you for having me. Scott Rae: Really appreciate it. Florenc Mene: If I could encourage you know all of our listeners, you're in the right place guys, and you have to realize you don't need to know everything to convince people about Christ. All you need to do is know your scriptures well. Keep on walking with Jesus, and God will use it in ways you never thought possible. This has been an episode of the podcast, Think Biblically, conversations on faith and culture. If you've enjoyed today's broadcast with our guest, Florence Mene, our Albanian friend, share it with a friend. Give us a rating on your podcast app and remember, Think Biblically about everything.